In 1565, invaders poured into the magnificent city of Hampi, one of the largest cities in the world at that time, leveling many of the buildings and much of the artwork, and slaughtering nearly all the city’s residents. Located in the southern state of Karnataka, in India, the Hazara Rama Temple is one of the most remarkable temples of this ancient city. Inside are black polished stone columns, exquisitely carved. At the city’s final hour, as the marauding armies drew near the city gates, some of the temple devotees were thinking only of protecting the temple’s central icons. During the destruction of Hampi, many sculptures all over the city, icons that were worshipped and revered, were violently smashed and broken. Some fragments lay on the ground for hundreds of years afterwards, with no way of restoring them. If one looks closely at the floor of the temple interior of the Hazara Rama Temple, one can see four empty rectangles where today nothing stands, yet clearly sculptures once stood there. Apparently, as the armies approached, some worshippers, with the help of others – no one knows who – were able to spirit away four of the key temple icons – Rama, Laksmana, Sita, and Hanuman – before the invaders broke through the gates. The unknown devotees who, out of love for the Gods they worshipped, moved them in the dark of night, must have buried them in an unknown location, intending to return later to restore them to the temple. It seems they were never able to return. Thanks to their brave act of devotion, the icons, which have never been found, rest in peace and were spared from being broken. The outside walls of the temple remained intact and are lined with thousands of panels, beautifully sculpted, that tell the story of the Ramayana – one of the two great epic poems of India. The Ramayana is very long – several books, but in a nutshell the story is this: The ancient god-king Rama is looking for his wife, Sita, who has been kidnapped by the demon-king of Lanka (today’s Sri Lanka). Rama is distraught, not knowing what to do or where to look for his beloved Sita. In the forest of Kishkinda, he meets the monkey god, Hanuman – a magical being who becomes known for his undying loyalty and devotion to Rama and Sita. Hanuman brings light and positivity into a desperate situation; he travels with Rama to help find Sita, and time after time against impossible odds, he finds a way to overcome all the obstacles that block their way – building a bridge across the sea, transporting a whole mountain top on which healing herbs are growing, finding and communicating with the missing Sita, and then selflessly allowing Rama himself to rescue her. Hanuman brings the gift of life with his innocence, devotion, and magical abilities. Just across the river from the ruined city of Hampi, which is now a World Heritage Center, lies the wilderness of rocks and forests where Hanuman was born and where he spent his early life. This whole area was the forest of Kishkinda, many thousands of years before Hampi was built in the fourteenth century. All around the outside walls of the Hazara Rama Temple run the enchanting panels that depict, with immense charm, the story of Rama’s and Hanuman’s journey to find the lost Sita. While travelers flock to this spectacular late medieval city, it is Hanuman’s story and Hanuman’s presence that provide the backdrop for the city of Hampi. The wonderfully sculpted panels of the temple portray the events of the story. Hanuman is engaging and clever. He always finds a way where there seems not to be one. When he has no idea at all what he can do, or how he can help, he never gives up, and then an inspiration will come into his head. Sometimes he acts impulsively, without much advance planning. At the moment when he locates the cave where the kidnapped Sita is being kept, it dawns on him that he has never actually met Sita, and that naturally, not knowing who he is, she may be afraid of him. So, with his magical powers, he reduces his height, becoming very small and unthreatening, speaking very gently to her – appearing to be just a little forest monkey who would not harm anyone. Rama has also given Hanuman his signet ring as a token to give to Sita so that she will know that he has been sent by her husband Rama. That helps too. Hanuman has been sent by Rama to find Sita because, being a magical creature, he can fly through the air – something the human being, Rama, cannot do. 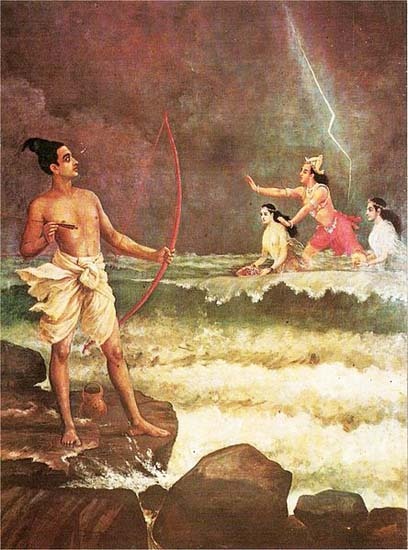 Rama cannot traverse the several miles of ocean that lie between India and Sri Lanka. Later, when the bridge has been built across the sea by Hanuman’s friends, the army of monkeys, then Rama also can cross the sea to Sri Lanka. Hanuman is intensely charming because, in his innocence, he does not recognize his own strength and his own powers. It is only when he is reminded by someone else that he becomes aware that he can do amazing tasks, such as getting his monkey and bear friends to build a bridge across the ocean, that he can fly, or grow smaller or taller, or pick up a mountain and carry it thousands of miles – that he has the powers and the ability to find and restore to Rama, his lost wife Sita. But there is something else very captivating and charming – and that is the intense devotion to Hanuman of the sculptors and temple builders who created these beautiful evocative images of Hanuman – and the reverence of the many thousands of worshippers who come here to see this re-creation of the life of Hanuman and the story of Rama and Sita. It is with great love and faithfulness that artists carved the wonderful lifelike images of Hanuman and all the other beings in the story. It is with profound reverence that they brought the images to life. An uncomprehending eye might say that after all, this is just the story of a flying, talking monkey – something like a child’s story from thousands of years ago – about a forest animal that travels through the air — what could be its relevance today? But the devotees from all over India and from farther away who visit these beautiful images do not see it that way. Instead they are caught up in the magic of this heroic presence, Hanuman – always faithful, always innocent, ever brave, and endowed with the magical gifts needed to bring light, life, and a happy ending to this ancient tale. It is a story of profound loyalty and a beautiful heroic spirit – a story always relevant to all times and all places. Thank you to Dr. Nanditha Krishna for her profound insights into the character of Hanuman. 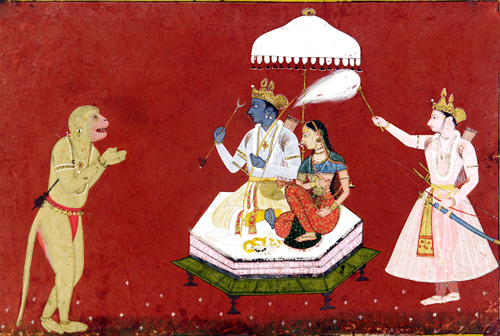 Top photo: Hanuman on the right, and, above, giving the ring to Sita. Second photo: The temple interior. Third photo: More scenes from the Ramayana. Fourth photo: A winged being. Fifth photo: A black polished column and a visitor to the temple. In the great Indian epic, the Ramayana, when Laksmana, the brother of the hero Rama is lying unconscious on the battlefield and all seems lost, their loyal friend, the divine monkey, Hanuman, flies through the air all the way from Sri Lanka to the Himalayas to bring life-saving herbs back to the herbal doctor who can use them to heal Laksmana. In fact, it turns out that Hanuman has to bring back the entire mountain on which the herbs are growing because when he arrives in the Himalayas, he realizes that he doesn’t know the difference between one herbal plant and the next, so he can’t just pick out the right ones. All ends well, fortunately, and when Hanuman returns to Sri Lanka, the herbal doctor is able to use the right herbs from the transported mountain to revive Laksmana from the brink of death and restore him to good health once again. The world of plants is central to the Ramayana, and though this long poem of several books was written thousands of years ago, the trees and plants depicted in this amazing epic, are geographically accurate, and even today, the plants that are described are found growing in the exact locations all over India where Valmiki, author of the Ramayana, has placed them. It is all geographically and botanically correct. Mr. M. Amerthalingam, botanist with the C.P.R. Environmental Education Centre, Chennai, presented the paper, “Plant Diversity in the Valmiki Ramayana” at the February 2013 Conference on The Ramayana in Literature, Society, and the Arts. The proceedings have recently been published. He highlights the extraordinary range of the plant life of India at the time and notes the precise descriptions each of the 182 different plants mentioned in the Ramayana. Fewer and fewer people these days see the Ramayana, one of the two great epics of India, as a work of mythology or fiction. Indeed, it has never been viewed as anything other than history in India. Only western scholars have had difficulty accepting the basic historical reality of Rama, Sita, and the events of their lives. It is true enough that there are poetic aspects to the story – and whether or not Hanuman really flew through the air or not may be questionable, but that Rama and Sita did really live and that the major events of their lives are true is accepted as fact. The dates when they lived are the subject of much scholarly speculation, but possibly they lived around 3,000 BCE, or maybe earlier, or maybe later. Mr. Amerthalingam has compiled a list of all the plants described in the Ramayana. In his travels to rescue his wife Sita, who had been abducted, the hero Rama traveled from Ayodhya in the north of India to Lanka (Sri Lanka) in the south. On his way, Rama journeyed through numerous forests, each was unique, and remarkably, each account is true to the actual plant life which is native to that forest. In the beginning of the epic, in Chitrakoot forest where Rama and Sita spent time in exile, there were many beautiful flowering trees; mango and jackfruit; there were neem and bamboo, and a host of other trees, all of which are found in that area today and which are described very precisely. In the Dandakaranya forest, there were tall trees and trees bearing fruit. The Panchavati forest, from where Sita was abducted, lies on the banks of the River Godavari. In Sri Lanka, there were evergreen forests – these are not the kind of evergreens one might think of in the west, like spruce, pine, and fir trees – they were the evergreens in India and Sri Lanka which remained green year round, like the ashoka tree, a rain forest tree with lovely red flowers. In what is today the Bellary district of the state of Karnataka, Rama met Hanuman and Sugriva, two leaders of the monkey people who, throughout the epic poem, provided invaluable assistance to Rama in his search for the lost Sita. Without Hanuman’s help, it is hard to see how Rama could have rescued Sita. They spent some time there in the forest, near the Pampa sarovar (lake) among a great wealth of trees and plants – both moist and dry deciduous plants. There were rose-apples, banyan trees, jackfruit, peepal, and mango trees, sandalwood, ashoka, and kadamba. There were lotuses, lilies, wild cherries, and jasmine, and around thirty more species, all mentioned by name. In the story mentioned above, during a huge battle that took place between the forces of Rama and the demon king Ravana, when Rama’s brother, Lakshmana, was lying unconscious on the battlefield, the doctor Sushena asked Hanuman to fly to the Himalayas. Hanuman set off, flying through the air over the snow-covered terrain until he reached the Dronagiri Mountain. After Hanuman had picked up the entire mountain and flown back with it, Sushena was able to identify the four herbs that were required; Mrita sanjeevani (which brings the dead back to life), Vishalyakarani (which cures all wounds caused by weapons), Suvarnakarani which restores the body), and Sandhani (which joins severed limbs and fractured bones). Thanks to the herbal knowledge of Sushena and the strength and heroism of Hanuman, Lakshmana sprang back to life and was ready to fight again. The entire Ramayana is filled with beautiful and very accurate accounts of plants. On the island of Lanka, it was forbidden to cut down trees. Although the demon king Ravana was a criminal, guilty of abducting Sita, he did always show a sincere appreciation for trees. In his country, planting trees was considered a very praiseworthy activity. It was believed that a wood cutter and his family would suffer death and destruction as a karmic consequence of harming trees. Trees were worshipped in Lanka and throughout India, as they still are today. It is clear from the detailed and abundant descriptions of the 182 plants that the Ramayana could only have been written in India, and that the author, Valmiki, was writing botanically correct information. He was also absolutely familiar with the medical uses of the plants. 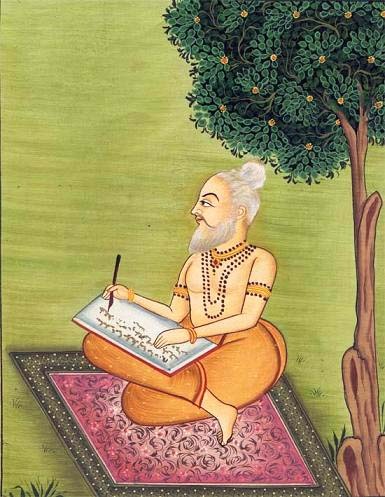 Keenly aware of plants, Valmiki knew them exceptionally well. Today so many of us are unaware of plants; we brush them aside into the background, not listening to what they have to say and unaware of the souls of the living world around us. Only by once again revering the world of trees and plants can we reawaken our consciousness to the natural world, so that the earth may be restored and renewed. Thanks to Mr. M. Amerthalingam for his amazing knowledge of these trees and plants and for bringing them to life for us. The Proceedings of the Conference on The Ramayana in Literature, Society, and the Arts, February 1-2, 2013 has been published by C.P.R. Publications, C.P.R. Institute of Indological Research Chennai. To visit their website, click here. To find the book, Sacred Plants of India by Nanditha Krishna and M. Amerthalingam, on Amazon, click here. Top photo: Photographer: Eric Guinther / permission: GNU / Wikimedia Commons / “Permission is granted to copy, distribute and/or modify this document under the terms of the GNU Free Documentation License, Version 1.2…” / Leaves of the peepal tree. Second photo: Photographer: J.M. Garg / Wikimedia Commons / “This file is licensed under the Creative Commons Attribution 3.0 Unported license.” / Leaves of the neem tree. Third photo: Author: ProjectManhattan / Wikimedia Commons / “This file is licensed under the Creative Commons Attribution-Share Alike 3.0 Unported license.” / The jackfruit tree. Fourth photo: Original uploader was Indiancorrector at en.wikipedia / Wikimedia Commons / “This work has been released into the public domain by its author, Indiancorrector at the wikipedia project. This applies worldwide.” / Kishkindha, the kingdom of the monkey people in the Ramayana, view from atop Aanjaneya Parvat, near Hampi, in Karnataka. Across the stage, the dancer Anita Ratnam engages the sparkling, magical butterfly in conversation, one beautiful day in the woodlands. She trails after the butterfly from branch to branch, and they talk to each other. It turns out that the lovely butterfly is really Manthara. When she appears in her human form in the story of Rama and Sita, Manthara is a quite different, unattractive creature, physically disabled as a hunchback, with a conniving, manipulative personality. Drawn to Manthara in her form as the innocent butterfly, Anita expresses her understanding of the pain that Manthara must feel in her human form, when she is the brunt of jokes and even has stones thrown at her by village boys. 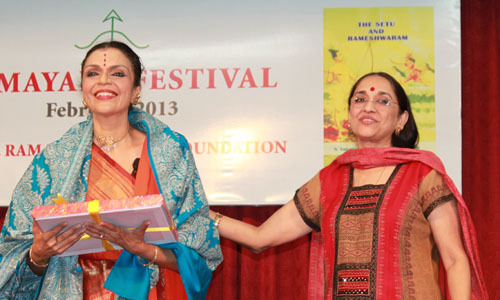 On Saturday, February 9, 2013, Anita Ratnam gave the complimentary performance “A Million Sitas” at the C.P.R. Centre for the Arts, as part of the Ramayana Festival being held at the C.P. Ramaswami Aiyar Foundation, in Chennai, during the month of February. One of the outstanding performers of Indian classical dance, Anita Ratnam has a Ph.D in Women’s Studies from the University of Madras, and has had a four-decades long, brilliant career in theatre and television, in the U.S., in India, and in a dozen other countries. Sita and Rama are embedded in the Indian consciousness. For five thousand years, every Indian woman has felt an inescapable connection with the role of Sita, who on a straightforward level, is the wife of Rama in the Hindu epic poem, the Ramayana. From the time they are tiny tots, all Indian children, both boys and girls, are surrounded by the enchanting songs and stories of Rama and Sita. The story of the Ramayana turns on the fate of Sita, who is abducted by the demon Ravana and in the end, after many twists and turns, is rescued by her husband Rama. When they return home, he is crowned king. Of course, in India, nothing is simple. At the beginning of the story, Sita, portrayed as the obedient, faithful wife, chooses to go with her husband when, through no fault of his own, he is banished into the forest. As well as being a faithful wife, however, Sita is far more than that; she is a strong, dynamic woman, with her own wishes, thoughts, and views. She is very learned and, although quite young, is a scholar. She is an environmental and animal advocate long before there was such a thing, appealing to her husband to give up hunting and to protect and respect the forest animals and their habitat. Ultimately, she is a Goddess, whose true place lies in heaven. She is absolutely central to the Ramayana; without Sita there would be no story. The performance “A Million Sitas” touches on many of the female roles in the Ramayana. All are intertwined with Sita – she is part of them, and they a part of her. Usually the character Surpanakha is portrayed as an evil demoness who falls in love with Rama and makes inappropriate advances first to him, then to his brother Lakshmana. Offended by her behavior, Lakshmana attacks her, disfiguring her face, and she flees back to her home in Lanka (Sri Lanka), complaining to her demon brother, Ravana, who then kidnaps Rama’s wife, Sita. In “A Million Sitas,” Anita reveals a radically different view of Surpanakha. 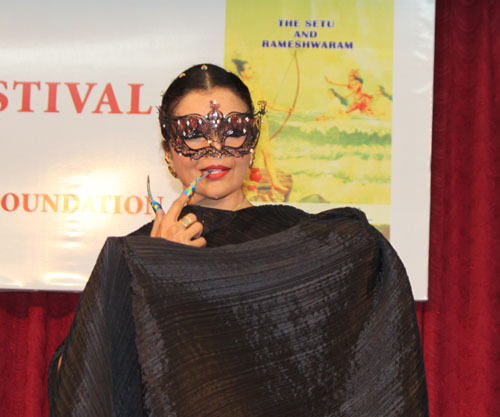 Anita’s dramatic portrayal of Surpanakha, wearing a black cape and an elegant mask, with long painted fingernails, shows us a tribal woman from a matrilineal society. For her there is nothing remotely shameful or inappropriate in the advances she makes to Rama and Lakshmana, which are, in her world, entirely normal and natural. Instead, it is the brothers’ brutal response that is shocking. To view the website of Anita Ratnam, click here. To visit the website of the C.P Ramaswami Aiyar Foundation, click here. Rama and Sita – history or myth? The Ramayana, one of the two great epic poems of India is known, not just throughout India, but all of southeast Asia, and to an extent, throughout the world. It has captured the hearts of billions of people over millennia. One of four brothers, Rama, as the eldest son of King Dasharatha, is about to be proclaimed the crown prince. Before this can happen, one of the wives of Dasharatha, Kaikeyi, demands that her own son, Bharata, be named crown prince instead, and that Rama be sent off to live in the forest for fourteen years. She demands this as her right because, once, many years before, she had saved the life of Dasharatha during a battle. At the time, he promised her two wishes, which she never claimed, and spurred on by her scheming maid, she chooses this moment to claim the two wishes. Virtually everyone in the city of Ayodhya is aghast at the thought of the beloved Rama, who is adored by all the people, being exiled to the forest. No one is more profoundly distressed than his father Dasharatha, who worships the ground that Rama walks on. Only Rama himself seems unperturbed and calmly accepting of his fate. Dasharatha is king, and as king he must honor his commitments, whatever the cost. He promised the two boons to his wife, and he must not go back on his word. He has no choice but to grant the two wishes, pledged so many years ago, and to send his beloved son into the forest. 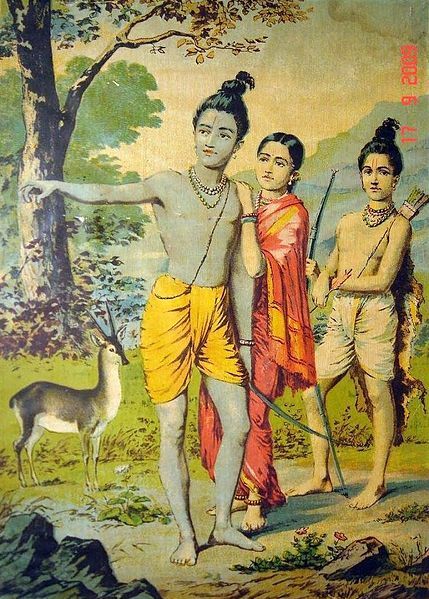 Rama leaves for the forest, accompanied by his loyal brother Lakshmana and his wife, Sita, who has insisted on going with her husband to live in the forest. After spending over twelve years living in the forest, one day Sita is abducted by the demon, Ravana and is carried off to Sri Lanka, Ravana’s kingdom. Rama, in despair, sets off to find Sita, and is only kept going by the help of his brother, and the many friends he meets along the way, including an army of monkeys and a wise old bear. One of the greatest heroes—perhaps the true hero of the story, Hanuman, is a divine monkey, who exemplifies the qualities of absolute loyalty and selfless devotion to Rama. With the assistance of so many loyal friends, Rama is able to defeat Ravana and rescue Sita. The two return to Ayodhya triumphant and, with the fourteen years of banishment over, Rama, with Sita at his side, is crowned king, in a happy conclusion. This is only the barest outline of the story which is infinitely complex, with every character existing on multiple levels, good and bad – divine and human –demonstrating nobility and a higher purpose, as well as human failings and flaws. The overarching theme of the story is that Rama illustrates the profoundly Indian concept of dharma – or righteousness. Never deviating from his appointed path, he is unfailingly loyal and obedient, first and foremost to his father. It is Rama himself who is determined to obey his father and who never hesitates a moment, following his destiny, to endure a hard life in the forest for fourteen years. This theme of loyalty, respect for one’s parents, and profound humility has carried through all of Indian culture, throughout the millennia, and is very much alive today in the heart of every Indian. The story of Rama and Sita, the greatest legend of India, and perhaps the world, was for a long time relegated by western historians to the unhistorical status of myth. One of the extraordinary reasons early European writers gave for this was that James Ussher, an Archbishop of Ireland in the seventeenth century, had calculated, based on the Bible, that the earth itself had been created on October 23, 4004 BC. Consequently, any records, anywhere in the world, which went back before that date must be mistaken. Rama and Sita thus fell into the category of myth, and there they remained until recent years. During the Ramayana Festival Conference at the C.P. Ramaswami Aiyar Foundation in Chennai, India, February 1-3, it became abundantly clear that the age-old tale is in fact based on history and is not simply mythical. Indian scholars and authorities are increasingly questioning the assumption by western authorities that the tale is nothing more than a story. Every event in the story is firmly based on geography, having a precise location that can be pinpointed on a modern map. The Ramayana is filled with lovely descriptions of trees and plants which are all geographically and scientifically precise. The trees near the kingdom of Ayodhya are those species that are found there today. The trees in the various forests where Rama and Sita lived – and those on the mountain where they met the army of the monkeys are all real, botanically correct trees. Amazingly enough, though this is quite hard to explain scientifically, there is a mountain in Sri Lanka that is pointed, not rounded like the surrounding mountains. On it grow plants and trees that are found only in the Himalayas, over a thousand miles away. In the Ramayana, Hanuman, the monkey god, is sent off in the midst of a major battle, to bring back an essential herb that is found only in the Himalayas. 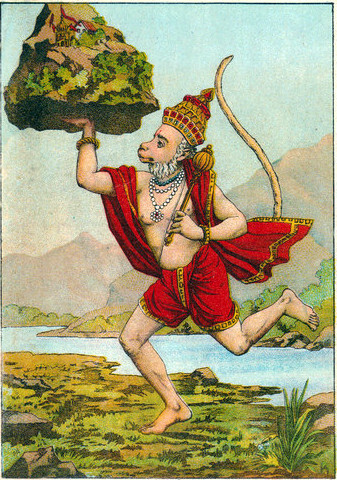 Hanuman flies through the air, finds the mountain, and then realizes that because he is not a herbalist or a botanist, he has no idea how to recognize the herb he has been sent to get, which is urgently needed to revive Rama’s brother, Lakshmana, who is lying unconscious on the battlefield. All the herbs and plants look alike to Hanuman. Perplexed, he solves the problem, by picking up the entire mountain and flying back to Sri Lanka with it held aloft in one hand. Lakshmana is given the correct herb and recovers. Whatever all this means, who knows, but the herbs and plants growing on the only pointed mountain in Sri Lanka, grow nowhere else except in the Himalayas. The tribal peoples of India have many legends about Rama, Sita, and Ravana. The Gond people, for example, have legends that Rama and Sita visited them. These stories are unique to them, and are not found in the standard story of the Ramayana. This means that they have had a separate, native origin. They are not simply derived from the Sanskrit version of Rama’s and Sita’s life. This fact serves to confirm the authenticity of the historical reality of Rama and Sita – since they exist not only in Sanskrit stories, but quite independently – in tribal sources. The evidence for the historical reality of the lives of Rama and Sita grows only stronger as time passes. Tales and legends from many cultures throughout the world are being found to be not just made up as had for so long been the assumption, but to be based on the actual lives of people and on real history. Top photo and second photo: Sharon St Joan / Students from the Grove School enacting scenes from the Ramayana. The Grove School is run by the C.P. 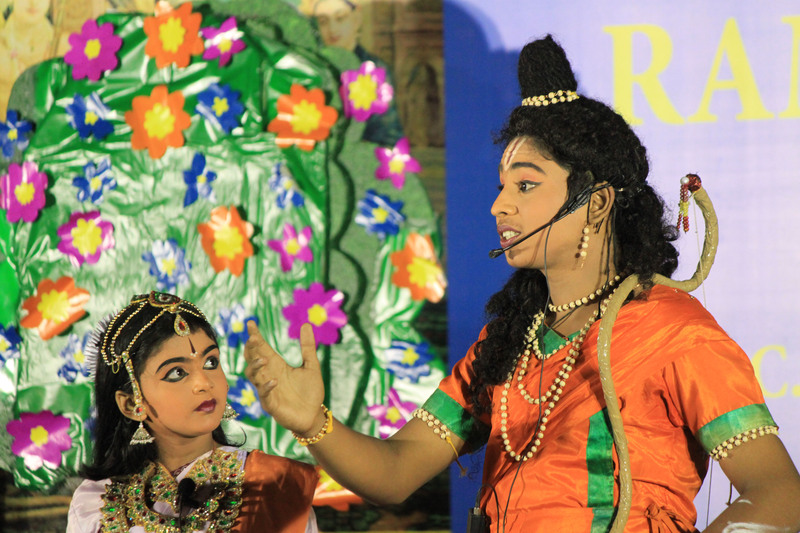 Ramaswami Aiyar Foundation and the students took part in the Ramayana Festival. To visit the website of the C.P. Ramaswami Aiyar Foundation, click here. N. Vanamamalai Pillai’s “Setu and Rameshwaram” is one of three publications to be released at the Ramayana Festival to be held from February 1 – 24, in Chennai, at the C.P Ramawswami Aiyar Foundation. The Setu is a natural bridge of limestone shoals extending 18 miles from India to Sri Lanka. It was first mentioned in the epic poem, the Ramayana, by Valmiki. To learn more about the Ramayana Festival 2013, please visit the Ramayana Festival website. The C.P. RAMASWAMI AIYAR FOUNDATION is celebrating the role of the great epic in the culture of India and South-East Asia. The Ramayana is a great epic which knows no boundaries of religion or nation. It has taught the values of life and behaviour to men and women over centuries, across India and South-East Asia. There is no finer example in the world of a multi-religious, international culture than the Ramayana. Scores of generations of children have watched performances and narrations of the great epic over 2,000 years, to learn the importance of an ethical life. This has been the cornerstone of the life of India and South-East Asia. Many kings in these countries have taken the name of Rama, cities and islands have been named after persons and places in the epic and symbols of Vishnu (whose incarnation is Rama) have been royal emblems across the region. The story of the Ramayana is enacted more often than any other story of the world. It is performed by Hindus, Buddhists and Muslims. It is the most important cultural tradition of Thailand, Cambodia, Indonesia, Laos, Myanmar, Nepal and India. It has also been widely prevalent in Singapore, Malaysia and Vietnam. The Ramayana is the great bond of culture which unites India and the countries of South East Asia. FEBRUARY 1, 2013, at 10 a.m.– INAUGURATION by His Holiness SWAMI DAYANANDA SARASWATHI. 1 VALMIKI RAMAYANA by late Justice N. Chandrasekhara Aiyer. 2 THESETU AND RAMESHWARAM by late Shri N.Vanamamalai Pillai. VENUE for all programmes – The C.P. RAMASWAMI AIYAR FOUNDATION, 1 ELDAMS ROAD, ALWARPET, CHENNAI 600018. The Ramayana as it has been created in early 20th century oleographs, miniature and folk painting, bronzes, terracotta and popular toys will be on display. A map of India with Rama’s route from Ayodhya to Lanka and scenes of the various events that took place in each site will be depicted by clay toys. 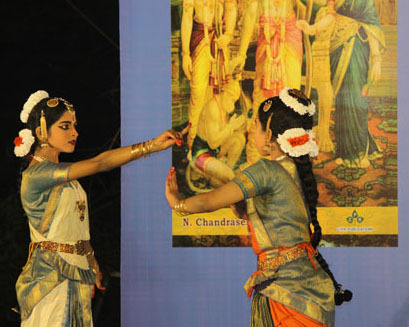 There will be performances of the RAMAYANA in HARIKATHA, MUSIC and DANCE during this period. The final programme will be posted later. FEBRUARY 1 and 2 – International Conference on the RAMAYANA in LITERATURE, SOCIETY and the ARTS organised by C. P. R. INSTITUTE OF INDOLOGICAL RESEARCH. All conference participants should be registered. While there is no participation fee, we are limiting the number of participants, so please register as soon as possible. For further information, please write to the above e-mail / postal addresses. The C.P. Ramaswamy Aiyar Foundation is celebrating the role of the great epic in the culture of India and South-East Asia. An international conference to research the impact of the Ramayana in Literature, Society and the Arts will be held on February 1 & 2, 2013 at CPR Institute of Indological Research (CPRIIR), No.1, Eldams Road, Alwarpet, Chennai 600 018, as a part of the RAMAYANA FESTIVAL. All conference participants should be registered on or before October 30, 2012. While there is no participation fee, we are limiting the number of participants, so please register as soon as possible. For further information, please write to the e-mail / postal addresses below.